So like, did you change your name from something? I have a feeling I should recognise you. I've been a mod for like a good two years iirc! But no problem though, haha. Even I'm losing track of when more happens. You would be Aikatsu here too. I"m not getting sucked into it. I mean I'll play a few lmao. Tell me if you want to play. I'm just gonna sit around for a while. Did you still want to play p4? And was like man, good times. LMAO I should have, that would have been hilarious. Yea, that character change was pretty interesting I also probably might not read it on my first train, probably can on the second one though. I think I'm halfway through 26. Not uh safe to say the least. Maybe I should watch it too. 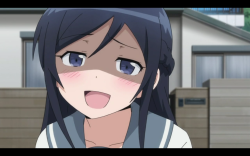 Are you watching Oreimo S2 btw? Pretty good indication of my face reading this. xD thats how statuses work. I don't really get it either tbh. Gotta get ready for that 8 AM class. Man, okay that's kinda true xD. Ugh but man, I'm more scared of the MC guy instead of the girl. The girl is actually just hilarious.